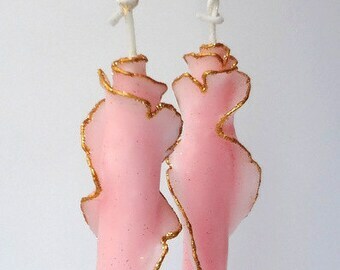 Pure Beeswax Glitter Rose Taper Candles handmade to order in the color of your choice. Handcrafted using my original designs & techniques, each candle is unique. Whether lit or displayed, these candles are meant to add beauty and joy to any decor. Can be mailed to you or directly to your gift recipient. Choose 6", 8" or 10" tapers in a pale shade of green, turquoise blue, pink, purple, or peach. Edges are adorned in your choice of gold or silver wax paint & glitter (or you can choose one of each!). These rose-shaped tapers are also available in custom colors, larger quantities, with no adornment or a variety of adornments to choose from. Contact me for info. "I was looking for a distinctive holiday gift and this was certainly it. Marcie was extraordinary in her attention to my wishes, in communicating her schedule and my delivery needs, and in sharing with me the look of the final creation and its packaging. This was my first Etsy experience and it is now the gold standard." "This candles are beautiful and very unique, my mom loves them. The store owner is also very helpful and you can tell she's very talented. These candles are a work of art." Photos show candles from previous orders. I hand-dye the beeswax in small batches to achieve unique colors. Paired tapers are made to complement each other, handcrafted by hand-shaping and dipping the delicate layers. No two candles look exactly the same. 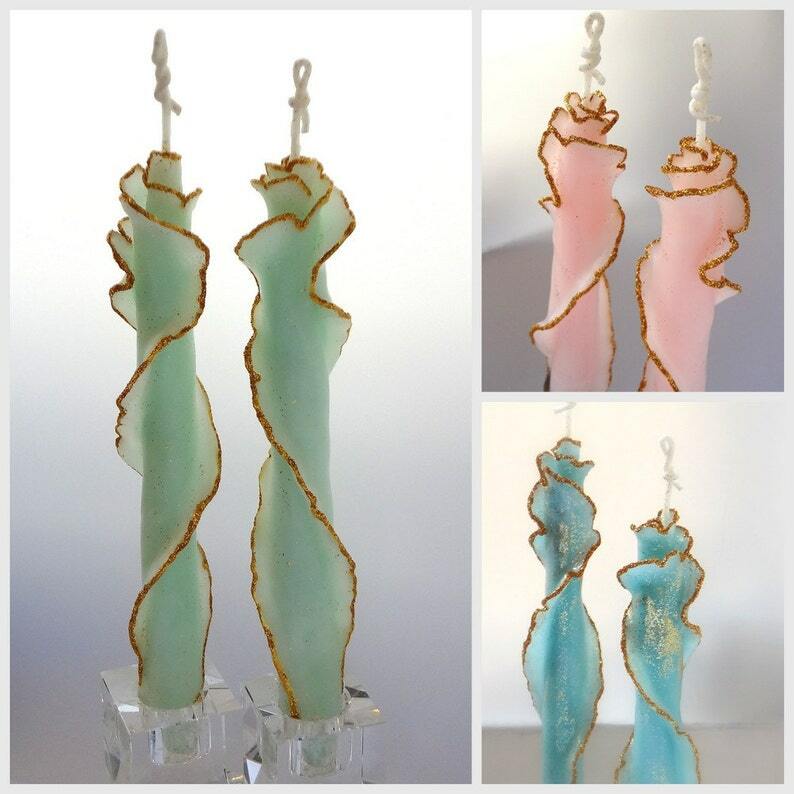 This listing is for one pair of tapers ( a set of two candles) in 6", 8" or 10". If you want an additional one or two pairs (in any height or color) add them to your cart if that quantity shows as available. Postage fee adjusts automatically for the additional weight (if ship fee turns out to be less to your location I'll refund overage paid). Want more tapers than shown as available? Contact me to add them to your order! See PAYMENT OPTIONS, ESTIMATED DELIVERY DATE & SHIPPING INFO for this item (and my general SHOP POLICIES) on the right-hand side &/or below this listing, depending on your viewing device. If you have any questions get in touch! Ships via USPS Priority Mail with tracking & insurance, usually 3 days delivery time but can take up to 5 days. Guaranteed overnight delivery (2 days to some locations) via Express Mail is an available option during checkout for an additional charge. The candles are as beautiful as I expected them to be. Ironically they arrived on a night I was having a dinner party and they were a hit! Unfortunately people don’t understand the time and energy that goes into hand made items. These are exceptional and deserve 1000 stars! Marcie does fantastic quality work. My candles were perfect for the display I wanted them for. It is important to say she also takes great care in the packing of the candles to be sure they are flawless when they arrive. I would definitely buy from her again for any specialty candle needs.